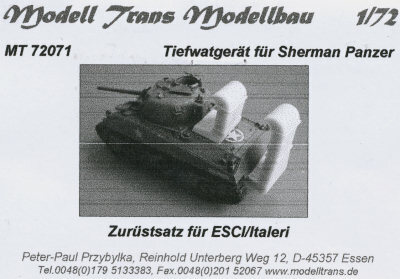 As typical for Modell Trans, the parts are very well made, with nice detail and excellent resin casting. The part on the left has a hollow bottom, and is placed on top of the engine air intake as shown in the cover photo. The grates covering the air intakes are a little muddied, though it will hardly be seen when assembled. When researching this kit, I learned quite a bit about the different styles of wading trunks used by the US Army. At first I thought that the trunks represented by this set weren't accurate, and looked like a cross between a couple of different styles, but I finally found a pair of photos that show these parts almost exactly as they appear here. They were apparently used during Operation Anvil, the invasion of southern France, and are sort of a cross between the two styles of trunks used in Sicily and Normandy. 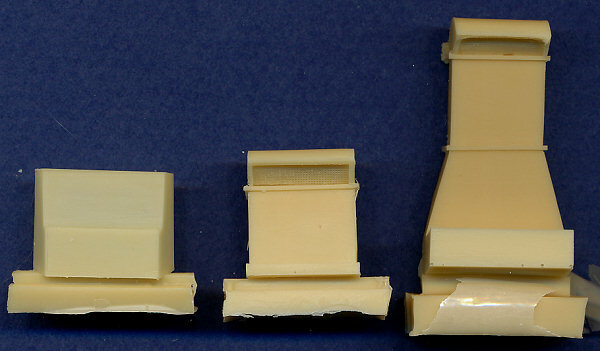 If you want to represent stacks used at Normandy, just remove the raised reinforcing ribs, and add a divider in the center of the air intake screen. The base of the rear stack would need to be slightly reshaped, but I honestly wouldn't go through the trouble, as it is only slightly different. Many thanks to Michael Hatch for his very generous gift box that included this item.